Going to start a new thread here related to automation. I spotted this Basic Stamp kit the other day while looking for something else coupla weeks ago. Cost about 90 bucks. Everything thats needed is included with the kit, except a PC. My goal is to get the servo, PC controlled. I need this, for a drive by wire interface for the variable lift feature of my injectors. I plan to mount this servo on a SB-612 injector assembly. Then control the throttle settings to a steam engine using a laptop. I will post more pictures as I go and maybe a youtube video or two. Athough the scope of this tread will deal with the micro-processor mostly. Last night I uploaded a video to U/tube. Fell asleep before I could put a link for it here. This video gives a good illustration of the rest of the necessary circuitry in order to operate one of the steam injectors that Im working with. The actual cam sensor has a sampling rate of 6000hz. Its mounted in the engine block, white plug with red indicator led. The cam sensor links to the switching array via opto-coupler. Its sampling rate is hundereds of thousands of hertz. Its the small circuit board with the four red things on it. When the engine runs to 4000rpm, the solidstate switching array, is only operating a about 85hz. This is the large aluminum piece with six fins. The actuation of the valve is 100% digital. Towards the end of the video you will see me and my dad next to a running engine, this footage is from almost 7 years ago. Things have advanced somewhat since then. As you see me throttle the engine, notice the bolt that im turning atop the injector assembly. This is the variable lift control, the servo will be connected there. Here's a song from one of the albums that I listen to, as im working thru these type of projects. Honestly, I have been doing this type of work with electronics since age 9. As a teenager I listened to a great many songs over and over, as I got into more advanced electronics, such as making my own integrated-circuit for a science project in the 9th grade. Ah, the memorys. I basically slept thru my electronics classes 101 to 105 for automotive, at ferris, got straight A's and B's. I figured id trade one up with U/tube, as I sit back and gain some perspective on this project. Its just my way, pay no attention to it. There's been a slight snag. 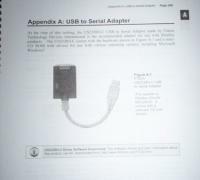 As im reading the manual for the basic stamp, there's this funny little notation, 'if your computer does not have a serial-port, then use such and such P/N to connect thru USB-port'. I read thru this an laughed, I said to myself, what computer does not have a serial-port, and kept reading. After I went thru the trouble to organize the tables in the spare bedroom, I found that my computer made in 2003, did not have a serial-port. As I pick one of these up, I will continue with the servo automation project.